The fleet of new Ford vans plying the snow-packed roadways of Yellowstone National Park this winter is certain to turn heads. Not only are they taller than street-ready vans, they boast panoramic side windows. But the truly odd components are their oversized tires — about 4-feet-tall and 3-feet-wide — that are inflated to such a low pressure (a mere 7 or so pounds) they look like partially deflated balloons. 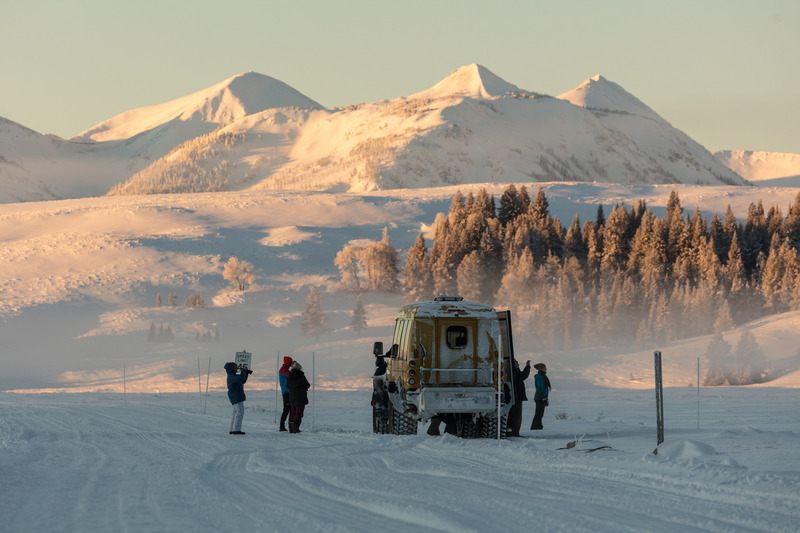 Consider the latest incarnation of Yellowstone’s 13-passenger snowcoaches the ultimate 21st-century sleigh, providing a ticket to ride through one of the world’s most extraordinary landscapes. Most of the fleet of 33 vehicles feature innovations certain to wow even winter-averse park visitors. And those odd-looking tires are the key to success. Distributing the vans’ weight over a broad area prevents them from sinking into the snow and getting stuck. The design enables travel in a landscape where seasonal snowfall can total up to 600 inches, and snowpack can reach as much as 10 feet above the roadways’ surface. Not that sometimes-epic winter conditions have deterred visitors of late. Winter tourism remains quieter than at other times of the year (just one of the plusses to visiting in winter), but it has increased in recent years from about 3 percent of the year-round total to 5 percent, notes Leslie Quinn, a long-time snowcoach driver/guide who now trains other drivers. The rise is partly a reflection of the overall increase in Yellowstone visitation. But a broader spectrum of tourists is venturing in, he adds. There was a time when most of Yellowstone’s visitors were private snowmobilers and a few cross-country skiers. “Now people who come in the summer find themselves wondering what this place is like when it’s a lot colder and covered in snow,” says Quinn. Multi-day offerings include guided cross-country ski and snowshoeing trips to the spectacular Grand Canyon of Yellowstone. Shorter adventures include a drive along the Firehole River with stops to view wildlife. A one-of-a-kind outing is the Steam, Stars, and Winter Soundscapes tour. Participants are outfitted with non-skid devices for their boots, flashlights and steaming hot chocolate in a souvenir mug. 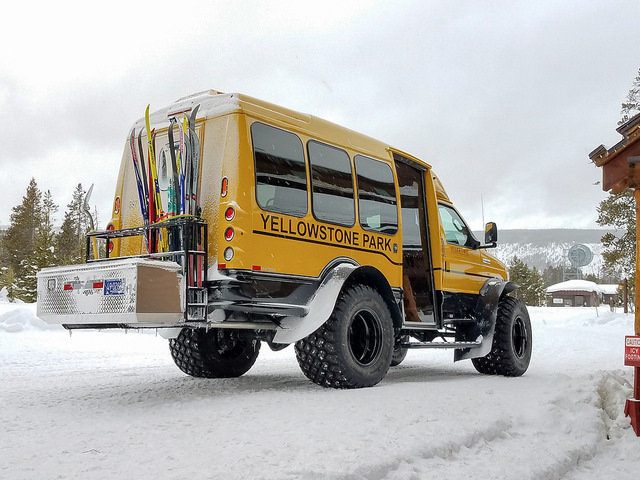 Snowcoaches take them to Yellowstone’s geyser basins for stargazing. For six decades, the Canadian company Bombardier manufactured park snowcoaches. 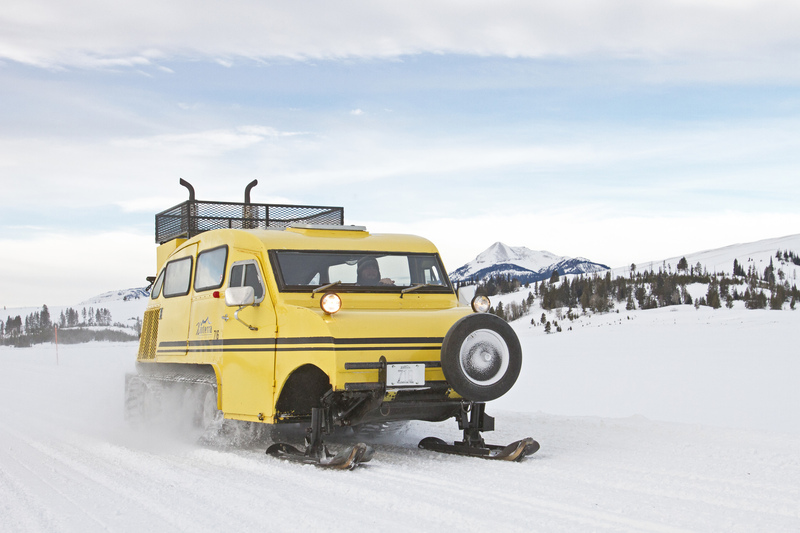 The classic, 10-passenger vehicles were equipped with tracks in the rear and skis in the front. They were efficient for navigating on snowpack, but interiors weren’t so commodious for passengers. Inward-facing bench seats gave riders clear views of each other — but not of the vistas they’d come for. Though roof hatches could be raised for more optimal views, for safety reasons the vehicles had to be stopped when doing so. A later innovation in the 1980s mounted cleat tracks at the rear, and skis on the front of vans. The forward-facing seats were an improvement for passengers, but the steel cleats were unfriendly to asphalt roads when the snowpack melted. The 1980s also brought Swedish-made military vehicles. They were “unstoppable, but slow and loud,” Quinn says. Not only does Xanterra’s new fleet of Ford snowcoaches offer comfort and panoramic views, they’re more fuel-efficient, getting up to 12 miles per gallon, compared to just 3 miles per gallon in earlier models. Sustainability along with winter’s magic — it’s doesn’t get much better than that. Washington, DC-based freelance writer Jayne Clark has been a travel reporter at USA TODAY and several other daily newspapers.